Not to brag about myself (or my beloved book group) but as a primarily children's bookstore we all find it a little ironic that one of our most popular book groups isn't for kids or for people with kids. The Catch-All Book Group is for "post-college, pre-baby twentysomethings." Really, though, we've had college students and thirtysomethings and I'm sure it won't be long before there are babies as well. And no, that's not my way of confessing to the blogging world that I'm pregnant. 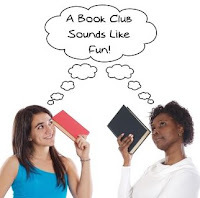 Anyway, all of our book groups provide a forum for book lovers to read something new and to discuss with others, and we love picking the books, organizing the meeting times and facilitating the discussions. But if you don't fit into any of our categories or if you already have your own group, fledgling or established, we still want to contribute to your book club experience. There are a few ways we do this. Your group can meet here at the shop in our upstairs space--food and drinks are totally welcomed. You'll get 15% off your books if you order them with us, and we can also help make suggestions about future reads. So next time you don't feel like cleaning your house before (or after) your book group meets, give us a call and we'll put you on our calendar. We just need to know you're coming a few weeks in advance. Now I hope I didn't jinx my book group attendance by bragging about it.